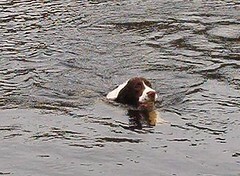 A 72-year-old man and his springer spaniel were fishing on their boat. When the man was throwing back a fish that he had caught, Bucky, the dog, put his paws on the edge of the boat causing the boat to flip it over. The man started swimming to shore but realized that he couldn’t make it, so he clung to the boat for dear life. Being the smart dog that he is (and making up for the fact that he did flip over the boat), Bucky swam to shore and barked for help while running home. The man’s wife heard Bucky barking and a neighbor called 9-1-1. The man and Bucky are both fine — but I don’t think either of them will be fishing anytime soon. This entry was posted on Friday, May 4th, 2007 at 3:53 am	and is filed under Dogs, National Dog, Cat & Pet Info, New York, News for Cats, Dogs & Owners. You can follow any responses to this entry through the RSS 2.0 feed. Both comments and pings are currently closed.